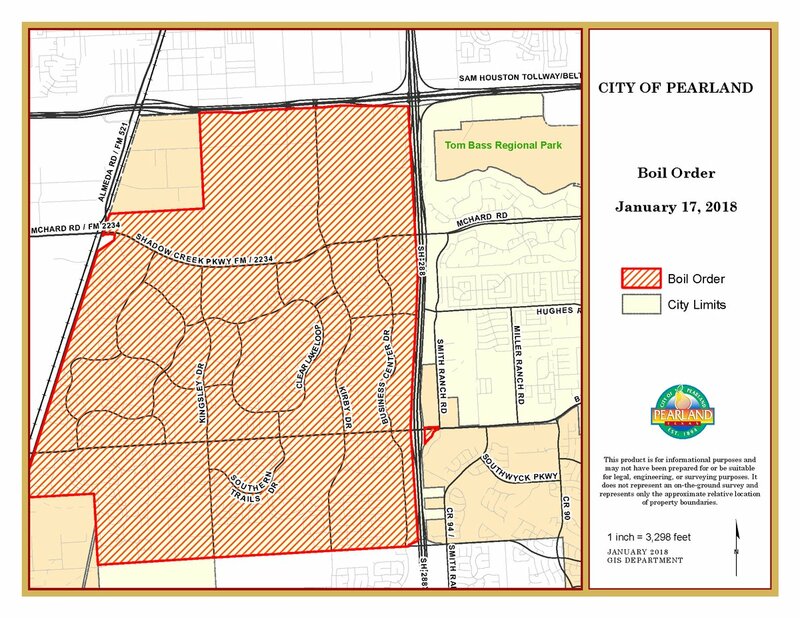 Updated 6:30 a.m., Jan. 18, 2018 –The City of Pearland tweeted late Thursday night at 11:03 p.m. that the boil water order is cancelled. The boil water order was cancelled after water test results for bacteria levels indicated the water was safe to use and full water pressure was restored. The boil water order affected residents and businesses west of Highway 288 due to major equipment failure at the city’s Kirby Water Production facility. The City of Pearland, Texas has ordered residents and businesses west of Highway 288 to boil their water until full water pressure is restored within the next 24 hours. Customers are advised to boil their water before drinking it, cooking with it, brushing teeth, washing hands and face, etc. The boil water order was issued “due to major equipment failure at the Kirby Water Production facility,” the City of Pearland tweeted Wednesday night. Another option is to use bottled water until the boil water order is cancelled. For more information, call the Pearland Public Works Department at 281-652-1900. This entry was posted in Consumer Alert, Health News, Houston News and tagged West Pearland Boil Water Order, West Pearland Boil Water Order Cancelled. Bookmark the permalink.